In this weather, I barely want to lift a hand to do anything other than flip someone off, but I'm willing to risk electrocution to tell you about some new stuff. Take this new Wasatch Summerbrau Lager (please!) for instance. At 5.6% ABV, it is a little heavier than some Czech Pilsners I am used to. 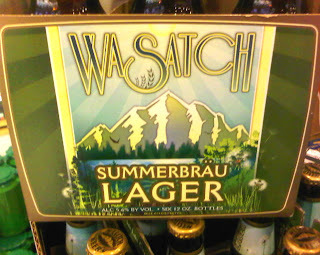 It's available all around our fine city in the $8.00 range for a six-pack. As far as distribution beers go, that's about all I have. Very slow in the new releases this week, though local breweries are thankfully picking up the slack. La Cumbre recently tapped the first keg of La Roja, an 8.1% Imperial Red that will be followed by Super Pils, an Imperial Pilsner, this Saturday. Around the corner, Il Vicino has the Citra-heavy Exodus IPA, the beer that took top honors at last year's NM IPA Challenge. Finally, Marble has found space to once again make brewer's specials even during their busy expansion. The wildly popular Double White makes its return on tap along with a sessionable 4.2% ABV Pale Ale. And don't forget about Nexus, which has all their house beers on tap now, including the second go-round on their IPA in which the hops are much more pronounced than the first batch.